Currently browsing posts filed under "Nate Krissoff ’03"
Since war came to the West on September 11, 2001, only a handful of Ephs have read these words. Are you among them? Each morning I watch the sunlight drifting down through the pines, scattering the clouds from the mountain sides, driving the mists from the glens. Each night I see the purple lights as they creep up the slopes of the Dome and the shadows as they fall on wood and stream. My home is among young men — young men who dream dreams and see visions; young men who will carry my banner out into the world and make the world better because they have lived with me in my valley amid the hills. Among my sons who have left me, some have caught the poet’s fire, and their words have touched men’s hearts and have bought cheer to a weary world. This 1926 eulogy, written by Professor of Rhetoric Carroll Lewis Maxey, comes from page 136 of Williams College in the World War, a beautifully arranged remembrance of those Ephs who served in freedom’s cause during the Great War. To Williams students today, World War I is as far away as the War of 1812 was to the generation that Professor Maxey sought to inspire. What will the great-grandchildren of today’s Ephs think of us? What will they remember and what will they forget? 1st Lt Nate Krissoff ’03, USMC died twelve years ago today. For the first year after his death, we maintained a link at the upper right to our collection of related posts, as sad and inspiring as anything you will ever read at EphBlog. Yet that link came down. Time leaves behind the bravest of our Williams warriors and Nate’s sacrifice now passes from News to History, joining the roll call of honored heroes back to Colonel Ephraim Williams, who died in battle during the Bloody Morning Scout on September 8, 1755. More than 250 years have marched by from Ephraim’s death to Nate’s. But the traditions of military brotherhood and sacrifice are the same as they ever were, the same as they will ever be as long as Ephs stand willing to do violence against our enemies so that my daughters and granddaughters and great-granddaughters might sleep safely in their beds at night. Consider this moving ceremony in Iraq for Nate in the week after his death. Before there was Taps, there was the final symbolic roll-call, unanswered. “Krissoff,” intoned Sergeant Major Kenneth Pickering. By culture and custom, the Marine Corps is given to ritual and none so important as the farewell to comrades who have fallen in battle. And so the memorial service here for 1st Lt. Nathan Krissoff, intelligence officer for the 3rd Reconnaissance Battalion, was both stylized and achingly intimate. Why Marines must fight and die? I can only remember snatches now, three decades later. It was a short song, repeated slowly, with emotion. For years, I have looked for the words to that plaintive melody, the eternal warrior’s lament of pain and suffering. Gunny Anderson only sang it with our platoon a handful of times, only when he felt that we were worthy of inclusion in the brotherhood of arms. The last of those times was near the end of our training. At OCS, the fun-filled day begins with PT (physical training) at around 0500. Our entire company (200 men) is standing at attention in the humid Virginia morning. Back in July, there had been plenty of light to start exercising that early, but, by August, the later sunrise left us all waiting in darkness. Gunny Anderson had the “duty” that morning, so he was the only member of the staff present. The others, well aware of the timing of sunrise, would be along shortly. Gunny Andersen, recognizing that graduation day was near and that he had us all to himself, led the entire company in that song, including the other platoons who had never heard it before. And he did it in a whisper. We all stood there — having survived almost 10 weeks of brutal training, shouting our lungs out day after day — and whispered the song with him, 200 voices joined with the spirits of the Marines who had gone before us. Nate is with those spirits now. When the next Eph Marine is marching on that same parade deck during OCS, Nate will be watching him as well. I remember the name of my platoon sergeant from 30 years ago. My father still remembers the name of his platoon sergeant from 55 years before. Let none of us forget the sacrifices of Marines like Nate and Myles Crosby Fox ’40. Krissoff, 25, a champion swimmer and kayaker in college, was killed Dec. 9 by a roadside bomb that also injured other Marines. Hundreds of grim-faced Marines who knew Krissoff came to the Chapel of Hope, the converted Iraqi Army auditorium, for the service. By all accounts, Krissoff was a charismatic leader who had impressed his superiors and earned the trust of his subordinates. War always takes the best of my Marines. Yet that is not the way that real Marines think about our Corps. Despite defending an independent, freedom-loving country, the Marines are fundamentally socialist in outlook. Everything belongs to every individual. This is not just my rifle or my uniform, but my tank and my obstacle course. And what is mine is yours. See the bootcamp scenes from Full Metal Jacket for an introduction to an outlook as far away from Williams College as Falluja is from Williamstown. At OCS, the worst sin is not to be slow or stupid or weak, although all these sins are real enough. The worst sin is to be selfish, to be an “individual,” to care more about what happens to you then what happens to your squad, your platoon, your battalion or your Corps. What happens to you, as an individual, is irrelevant. To get the full effect of this instruction, you need to imagine it being shouted from 5 inches away by the loudest voice you have ever heard. Yes! Indeed! I am an individual! Four hundred of years of Enlightenment philosophy have demonstrated that this is true. My degree in philosophy from Williams College has taught me that I, as an individual, have value, that my needs and wants are not subservient to those of the larger society, that I have a right to life, liberty and the pursuit of happiness. For once, I kept my mouth shut. In quieter moments at OCS, I recalled Rousseau’s parable of the Spartan mother from Emile. A Spartan mother had five sons in the army and awaited news of the battle. A Helot arrived; trembling she asked his news. She ran to the temple to give thanks to the gods. That was a citizen. For Rousseau, there are two ways for a man to be free. First, he can live alone, cut off from humankind but self-sufficient. He needs no one. Second, a man can be a citizen and so, like the Spartan mother, unconcerned with his own, and his family’s, well-being. All that matters is the polis. A Marine is many things, but not a freakin’ individual. He grew up in Truckee, Nev., graduated from Williams College, majoring in international relations, and hoped someday to work for the Central Intelligence Agency. This is true and false. Marines do not sympathize with the insurgents whom they battle but they do empathize with them. “Clifton Chapel” by Sir Henry Newbolt describes this duality in the oath that every warrior takes. Most of those responsible for Krissoff’s death are now themselves dead, killed in battle by Krissoff’s fellow Marines. Do their families remember them with tears, as we remember Nate? Or are their memories fading along with ours? Recall how the Williams honored Nate ten years ago. 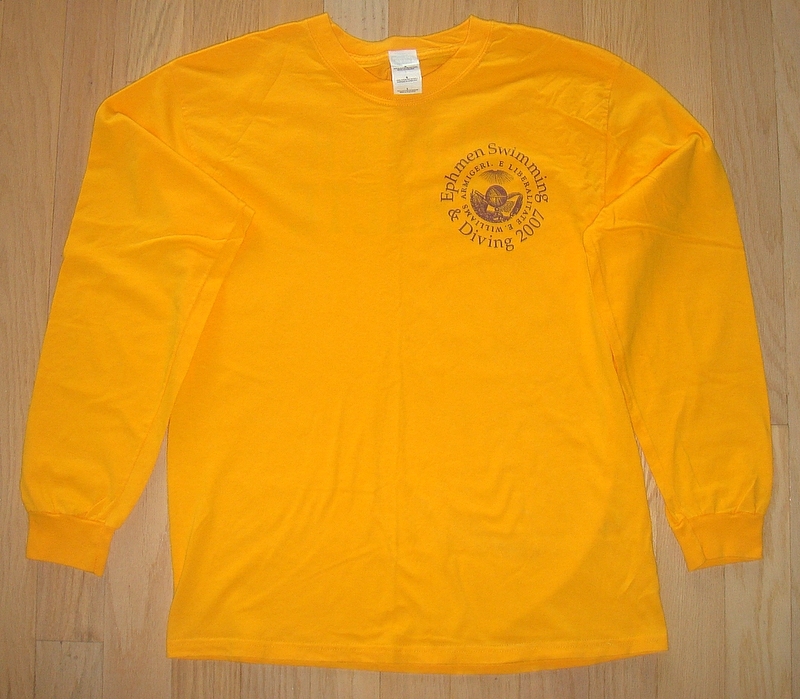 The Ephmen of Williams Swimming and Diving dedicated their 2007 championship season to Nate when they proudly wore their conference shirts emblazoned with the simple words on the back: “Semper Athlete.” (“Semper,” obviously for the Marines, and “Athlete,” one of his favorite terms for any of his teammates.) Nate would be proud of “his boys”: each of the 24 Williams conference team members had a hand in dominating the NESCAC competition. Yet how quickly these honors pass. How often do college officials mention Krissoff’s service? A swim team member I talked to last year knew about Nate’s sacrifice and reported that there is a photo of him at the pool and an annual swim in his memory. Kudos to Coach Kuster for helping Nate’s memory to live on. I did not know, when I first wrote of Nate’s death, that his fellow Marines would also be using “In Flanders Fields” as a way of memorializing his sacrifice. Who will take up the torch thrown by Nate? Are there any Williams students heading to OCS this coming summer? Are there no warriors left among the Ephs? Williams College in the World War opens with a call for remembrance. The wave of full-hearted devotion that rose in the World War has receded from its crest, as must have been in times more normal. But never will there be forgetfulness of it. Memory of the glory that wave bore aloft is the priceless possession of all the colleges. The service of Williams men enshrined in this volume is of abiding import. By it the past was made glorious, as the future will be shadowed while it is illumined. Natural it was to go forward when God quickened the souls of men to serve the need of the world, and so they held themselves fortunate. Indeed. Yet are Griffin’s assurances that we have nothing to fear from “forgetfulness” correct? I worry, and not just because of the contempt with which faculty members like Mark Taylor treat the US military. Consider the College’s official description of the most prestigious prize at Williams, the only award presented on graduation day. WILLIAM BRADFORD TURNER CITIZENSHIP PRIZE. From a fund established in memory of William Bradford Turner, 1914, who was killed in action in France in September, 1918, a cash prize is awarded to the member of the graduating class who, in the judgment of the faculty and of the graduating class, has best fulfilled her or his obligations to the College, to fellow students, and to self. The committee of award, appointed by the President of the College, is composed jointly of faculty members and members of the graduating class. He led a small group of men to the attack, under terrific artillery and machinegun fire, after they had become separated from the rest of the company in the darkness. Single-handed he rushed an enemy machinegun which had suddenly opened fire on his group and killed the crew with his pistol. He then pressed forward to another machinegun post 25 yards away and had killed 1 gunner himself by the time the remainder of his detachment arrived and put the gun out of action. With the utmost bravery he continued to lead his men over 3 lines of hostile trenches, cleaning up each one as they advanced, regardless of the fact that he had been wounded 3 times, and killed several of the enemy in hand-to-hand encounters. After his pistol ammunition was exhausted, this gallant officer seized the rifle of a dead soldier, bayoneted several members of a machinegun crew, and shot the other. Upon reaching the fourth-line trench, which was his objective, 1st Lt. Turner captured it with the 9 men remaining in his group and resisted a hostile counterattack until he was finally surrounded and killed. The most important prize awarded by Williams College is named in honor of a winner of the Congressional Medal of Honor, and virtually no one at Williams knows it. If Williams today does not remember that 1st Lt William Bradford Turner ’14 won the Congressional Medal of Honor, then who will remember 1st Lt Nathanial Krissoff ’03 one hundred years from now? Both died for us, for ALMA MATER, for Williams and the West. Krissoff’s brothers bade him farewell in Anbar just eleven years ago. When the roll-call and Taps were finished, the Marines came single-file to the altar to kneel in front of an inverted rifle with a helmet placed on the buttstock. Each was alone in his grief. 1st Lt Nate Krissoff ’03, USMC died eleven years ago today. For the first year after his death, we maintained a link at the upper right to our collection of related posts, as sad and inspiring as anything you will ever read at EphBlog. Yet that link came down. Time leaves behind the bravest of our Williams warriors and Nate’s sacrifice now passes from News to History, joining the roll call of honored heroes back to Colonel Ephraim Williams, who died in battle during the Bloody Morning Scout on September 8, 1755. Yet how quickly these honors pass. How often do college officials mention Krissoff’s service? A swim team member I talked to yesterday knew about Nate’s sacrifice and reported that there is a photo of him at the pool and an annual swim in his memory. Kudos to Coaches Kuster and Dow for helping Nate’s memory to live on. 1st Lt Nate Krissoff ’03, USMC died ten years ago today. For the first year after his death, we maintained a link at the upper right to our collection of related posts, as sad and inspiring as anything you will ever read at EphBlog. Yet that link came down. Time leaves behind the bravest of our Williams warriors and Nate’s sacrifice now passes from News to History, joining the roll call of honored heroes back to Colonel Ephraim Williams, who died in battle during the Bloody Morning Scout on September 8, 1755. A Spartan mother had five sons in the army and awaited news of the battle. A Helot arrived; trembling she asked his news. “Your five sons have been killed.” “Vile slave, was that what I asked you?” “We have won the victory.” She ran to the temple to give thanks to the gods. That was a citizen. Yet how quickly these honors pass. I asked a swim team member a few years ago about Nate and he sadly (and unsurprisingly?) had no idea what I was talking about. Will Coaches Kuster and Dow remind the team of those Ephs who have gone before? If Nate’s coach won’t speak of his spirit and sacrifice at Williams, then who will? Krissoff’s brothers bade him farewell in Anbar just nine years ago. 1st Lt Nate Krissoff ’03, USMC died nine years ago today. For the first year after his death, we maintained a link at the upper right to our collection of related posts, as sad and inspiring as anything you will ever read at EphBlog. Yet that link came down. Time leaves behind the bravest of our Williams warriors and Nate’s sacrifice now passes from News to History, joining the roll call of honored heroes back to Colonel Ephraim Williams, who died in battle during the Bloody Morning Scout on September 8, 1755. I can only remember snatches now, twenty five years later. It was a short song, repeated slowly, with emotion. For years, I have looked for the words to that plaintive melody, the eternal warrior’s lament of pain and suffering. Gunny Anderson only sang it with our platoon a handful of times, only when he felt that we were worthy of inclusion in the brotherhood of arms. I remember the name of my platoon sergeant from 25 years ago. My father still remembers the name of his platoon sergeant from 55 years before. Let none of us forget the sacrifices of Marines like Nate and Myles Crosby Fox ’40. Most of those responsible for Krissoff’s death are now themselves dead, killed in battle by Krissoff’s fellow Marines. Do their families remember them with tears, as we remember Nate? Or are their memories fading along with ours? Recall how the Williams honored Nate eight years ago. Yet how quickly these honors pass. I asked a swim team member last year about Nate and he sadly (and unsurprisingly?) had no idea what I was talking about. Wouldn’t it be nice if Coaches Kuster and Dow reminded the team of those Ephs who have gone before? If Nate’s coach won’t speak of his spirit and sacrifice at Williams, then who will? As soon as Bill Krissoff glanced out the front window during breakfast to see who had rung his doorbell at eight on a Saturday morning, he knew. Three Marines, ramrod straight in their dress blues, stood next to an Army chaplain. Nate, Krissoff’s elder son, twenty-five years old, had deployed to Iraq with an elite reconnaissance battalion as a first lieutenant in the Marine Corps. “We regret to inform you,” one of the Marines began saying once Krissoff opened the door. He doesn’t remember the rest. His head spinning, his body seized with shock, he stumbled through the house to wake up Christine, his wife. Soon they were sitting together on a living room sofa as the Marines explained, with grim solemnity, what had occurred a half day earlier half a world away from their home in Reno, Nevada. Nathan M. Krissoff, a counterintelligence specialist, had been returning to his base from a village near Fallujah when his Humvee drove over a bomb buried in a dry riverbed. The brunt of the blast hit the vehicle’s right side. Nate had been in the right rear seat. The Marines sat stoically, awaiting the next question Bill or Christine would ask. 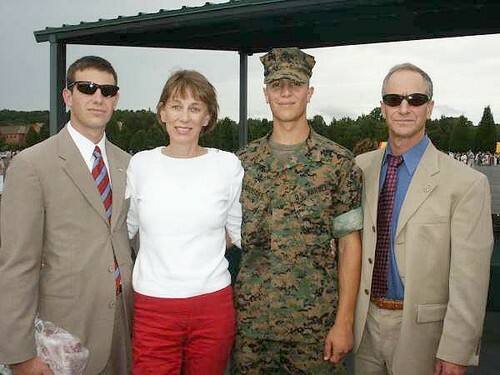 The Krissoffs wanted to call their other son, Austin, at the Marine Corps’ Officer Candidates School in Quantico, Virginia. Less than three years younger than Nate, he was following his brother’s trail from an elite prep school in Pebble Beach, California, to a small New England liberal arts college, and then into military service. 1st Lt Nate Krissoff ’03, USMC died eight years ago today. For the first year after his death, we maintained a link at the upper right to our collection of related posts, as sad and inspiring as anything you will ever read at EphBlog. Yet that link came down. Time leaves behind the bravest of our Williams warriors and Nate’s sacrifice now passes from News to History, joining the roll call of honored heroes back to Colonel Ephraim Williams, who died in battle during the Bloody Morning Scout on September 8, 1755. Most of those responsible for Krissoff’s death are now themselves dead, killed in battle by Krissoff’s fellow Marines. Krissoff’s brothers bade him farewell in Anbar just one year ago. This 1926 eulogy, written by Professor of Rhetoric Carroll Lewis Maxcy, comes from page 136 of Williams College in the World War, a beautifully arranged remembrance of those Ephs who served in freedom’s cause during the Great War. To Williams students today, World War I is as far away as the War of 1812 was to the generation that Professor Maxcy sought to inspire. What will the great-grandchildren of today’s Ephs think of us? What will they remember and what will they forget? 1st Lt Nate Krissoff ’03, USMC died four years ago today. For a year after his death, we maintained a link at the upper right to our collection of related posts, as sad and inspiring as anything you will ever read at EphBlog. Yet that link came down after a year. Time leaves behind the bravest of our Williams warriors. Nate’s sacrifice now passes from News to History, joining the roll call of honored heroes back to Colonel Ephraim Williams, who died in battle during the Bloody Morning Scout on September 8, 1755. 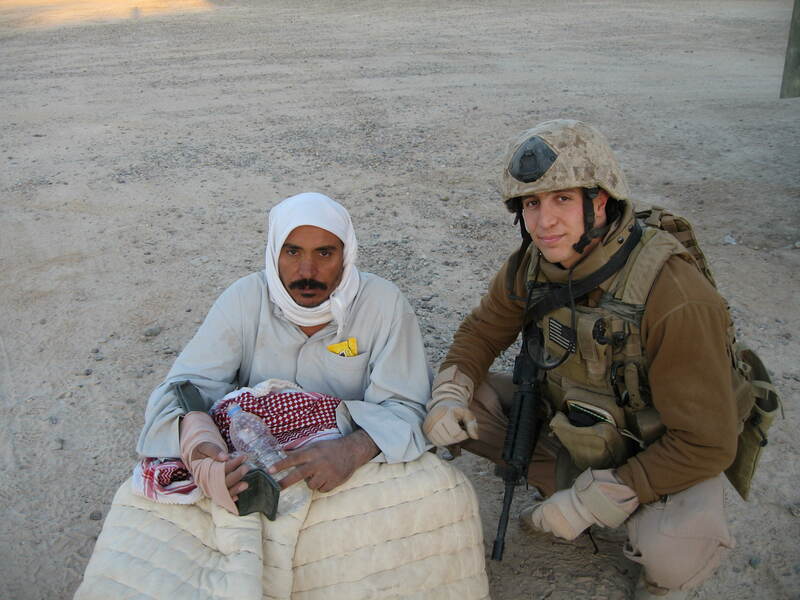 1STLT Nate Krissoff ’03, USMC died three years ago today. As long as there is an EphBlog, we will remember his service and his sacrifice. Read this and this. I’ve met a lot of these officers over the last few years, and have frequently been deeply impressed with them. A remarkable number of my students at Williams College (and later from George Washington) chose to serve in the military after graduation in the post-9/11 period (and some, like the much-missed Nate Krissoff, didn’t make it back). There is absolutely no reason why such officers and soldiers wouldn’t choose to pursue advanced degrees, or succeed brilliantly when they do. When they enter academic programs, these veterans will (and already do) bring a great deal of on-the-ground experience to the classroom and to their research. Many will (and do) enter their programs with far more advanced language skills than did earlier generations of students, although perhaps with more familiarity with colloquial spoken dialects than with Modern Standard Arabic (reversing a common traditional pattern). Their point of reference will be (and is) Iraq and the Gulf, not Israeli-Palestinian affairs, Egypt, Jordan, Lebanon, or other areas where a great number of current faculty began their encounters with the region. And they will have much greater familiarity and comfort with military and security issues than do many currently in the field. That’s not to say that there might not be depressing misperceptions on both sides. I’ve had a few soldiers interested in pursuing degrees ask me nervously whether they would be shunned by academics. I would be shocked if any experienced prejudice or bias because of their war service — certainly not at a place like GWU — and would be appalled if they did. I certainly hope that such concerns wouldn’t stop them from applying. I suppose there’s a chance that some faculty might feel threatened by students from such a background — but those are probably professors who have trouble in other areas as well, frankly. Constructive argument and productive friction between people with very different backgrounds, perspectives and knowledge should enrich and even electrify a well-run classroom, not cause problems. That’s a good, not a negative. To put it bluntly, most top political scientists don’t have a lot of experience beyond being political scientists. That is to say, the top Ph.D. students often enter graduate school straight from undergraduate programs. They might have interesting summer internships, but otherwise have limited hands-on experience with politics or international relations….. The problem comes when everyone in a profession pursues the identical career track — to the point where those who deviate from the career track are thought of as strange or different. At that point, the profession loses something ineffable. So, former members of the military should be ecouraged to enter Ph.D. programs — as should those who worked on the ground for NGOs and civil affairs branches of the government. I can’t guarantee that it will lead to better scholarship. At a minimum, however, it improves the quality of the teaching and the conversations that take place between colleagues. And I’m pretty confident that that leads to better research. For Lt. Cdr. 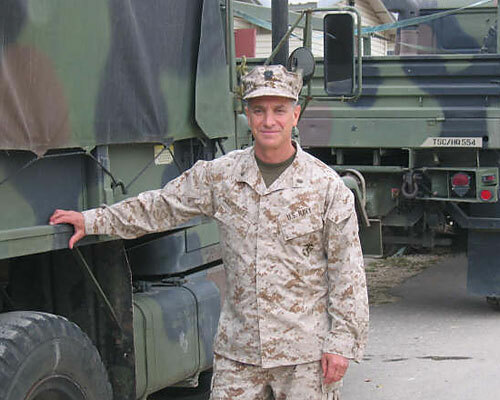 William B. Krissoff, 2nd Marine Logistics Group (Forward) orthopedic surgeon and a father of two Marine officers, the inspiration to join the Navy Medical Corps at age 60 stemmed from his sons’ bravery and commitment to duty. In particular, his service is a legacy to his oldest son, 1st Lt. Nathan Krissoff, a counterintelligence/human intelligence officer with the 3rd Reconnaissance Battalion who was killed in Iraq on Dec. 9, 2006. Both of Krissoff’s sons, Nathan and Austin, were deeply affected by the terrorist attacks of Sept. 11, 2001. Like many Americans, they wanted to show their support for the thousands of lives lost that day, but they didn’t simply raise an American flag on their lawn or put a bumper sticker on their car showing support for the troops. Instead, the Krissoff brothers took it one step further when they decided to join the Marine Corps, knowing that going to war may be inevitable. Krissoff knew very little about the Marine Corps then, but he knew that he could not be prouder of their decision to serve their country. Krissoff’s final push to join the Navy Medical Corps came from a visit their family received from the 3rd Reconnaissance Battalion commanding officer, Lt. Col. William H. Seely, and battalion sergeant major, Sgt. Maj. Kenneth C. Pickering. Both traveled across the country visiting the families of fallen Marines and those recovering from wounds, when they stopped in Nevada to visit the Krissoff family. They discussed the possibility of Krissoff serving as a doctor in a Marine unit and that’s when the future Navy doctor was convinced that he wanted to pursue his commission. 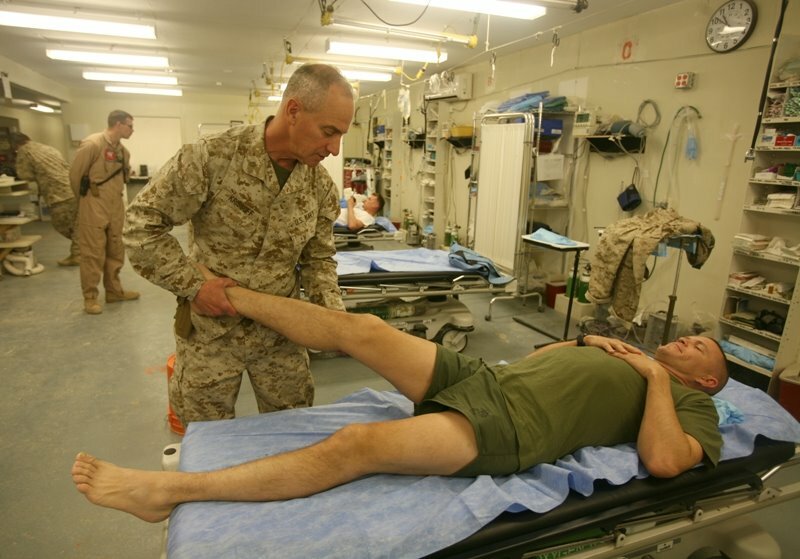 Aside from seeing patients, Krissoff has also had the opportunity to teach orthopedics to young Navy corpsmen, as well as battalion surgeons and flight surgeons. “This has been very fulfilling for me to work with the staff at TQ Surgical,” Krissoff explained as he nears the halfway point of the deployment. Krissoff didn’t join for the glory. He didn’t join for the fame. He did it as a tribute to his son and all of the service members who have and continue to go in harm’s way serving their country in forward-deployed environments. “I’m just a doc doing what I’m trained to do,” Krissoff emphasized. True and, yet, just a part of the larger truth. He thought it was a prank when he received a message on his answering machine from the White House. Later that month Bill Krissoff, a 60-year-old orthopedic surgeon from Truckee, Calif., his wife Christine and his son, 1st Lt. Austin Krissoff, were in a small room face-to-face with the president. Surrounded by the families of fallen service members, President George W. Bush asked if there was anything he could do to soothe the loss of their son, 1st Lt. Nathan Krissoff. Nathan died in Iraq from injuries suffered after a roadside bomb exploded December 2006. At 60 years old, 19 years over the enlistment age limit, Krissoff needed waivers to enlist. “The recruiter told me that it would take up to a year,” he said, adding that even then his chances didn’t look good. After his meeting with the president, Krissoff got his waiver in two days. Previous EphBlog coverage of Dr. Krissoff here, here and here. “Fathers usually inspire their sons, I was inspired by both of my sons,” he said. Though one can only imagine the kind of reactions he got for aspiring to serve at his age. Krissoff said he was determined. Even Austin was skeptical at first, he said. He closed his orthopedic practice in Truckee that year and was commissioned as an officer in the Navy Reserve in November. Now, Lt. Cmdr. Krissoff said he enjoys practicing medicine in the military and prefers it to his civilian practice. “In military medicine you are functioning as a team, taking care of each other. You aren’t worried whether he has insurance or about hospital politics,” he said. Krissoff, in shape and upbeat for a man in his early 60’s, said he liked the idea of working out of a tent. He is currently enrolled in the pre-deployment training program at 4th Marines Regimental Training Schools at Camp Schwab, Okinawa. He is slated to augment Combat Logistics Battalion 4, 3rd Marine Logistics Group, on their upcoming deployment to Iraq. Karl Rove writes in the Wall Street Journal. Sitting at my table was a friend, Christine Krissoff, wife of Dr. Bill Krissoff and mother of Nathan and Austin Krissoff. One of her sons, Marine First Lt. Nathan Krissoff, was killed in Al Anbar Province in December 2006. A Williams College grad, athlete and musician, he’d left for Iraq on the fifth anniversary of the 9/11 terrorist attacks. He was 25. Initial report of Krissoff’s death here. Update here. I cry almost every time I read about Krissoff. Do you? I met his parents and brother in Nevada in August 2007 while accompanying President George W. Bush to Reno, Nev. The president was there to address the American Legion before meeting with local families who’d lost a loved one in Iraq or Afghanistan. Mr. Bush has met with about 550 families in private visits like this. Say what you will about Bush, but he deserves credit for these meetings. I can’t even begin to imagine how emotionally draining it must be. Does President Obama do the same? I hope so. At those meetings, he would have a senior staff member close by in case there was something that needed to be followed up on, such as getting a flag to a family member. We entered a small room in the back of the convention center to find the Krissoffs waiting — the father in a black suit with his arms crossed and the mother in a plain dark outfit. Their dress contrasted with their son Austin’s Marine dress uniform. Like his older brother, Austin had volunteered for service after college. He was to be deployed to Iraq in March 2008. During my White House years, I saw few people with the quiet power, intelligence and poise of Chris Krissoff. She talked about her sons, the pain of her loss, her concern for her youngest when he went into harm’s way, and the stakes in the War on Terror. The entire time, her husband was quiet. Christine Krissoff will never have the chance to face death in the place of the father and son that she loves, but her war is no less real for that distance. “Yes,” he said. “I’m a pretty good orthopedic surgeon. When my younger son is deployed to Iraq next March, I would like to be working as a Navy medical officer, but they won’t let me because I am 61 years old. Will you give me an age waiver, Mr. President?” Mr. Bush pointed to me. Dr. Krissoff and I exchanged business cards and he promised to fax me his application. Krissoff received his waiver and is now serving in Iraq. Here is a photo from his training at Camp Pendleton. Christine Krissoff’s husband and sons, wrapped in prayers and armed with swords and scalpels, have served our nation with valor. So has she. So long as our nation produces families like the Krissoffs, America will remain not only the greatest nation on earth, but also the most noble in history. President Bush paid tribute 1STLT Nate Krissoff ’03, USMC and his father, a combat surgeon on his way to Iraq, in his presidential farewell address. We see America’s character in Bill Krissoff — a surgeon from California. His son, Nathan — a Marine — gave his life in Iraq. When I met Dr. Krissoff and his family, he delivered some surprising news: He told me he wanted to join the Navy Medical Corps in honor of his son. This good man was 60 years old — 18 years above the age limit. But his petition for a waiver was granted, and for the past year he has trained in battlefield medicine. Lieutenant Commander Krissoff could not be here tonight, because he will soon deploy to Iraq, where he will help save America’s wounded warriors — and uphold the legacy of his fallen son. In citizens like these, we see the best of our country – resilient and hopeful, caring and strong. These virtues give me an unshakable faith in America. We have faced danger and trial, and there’s more ahead. But with the courage of our people and confidence in our ideals, this great nation will never tire, never falter, and never fail. We first reported Nate’s death here and remembered him a year later. Read, and think of those in harm’s way tonight. In a few days, we will have a new President and Congress, but the missions and responsibilities of America’s warrior class transcend our petty politics. God bless them all. 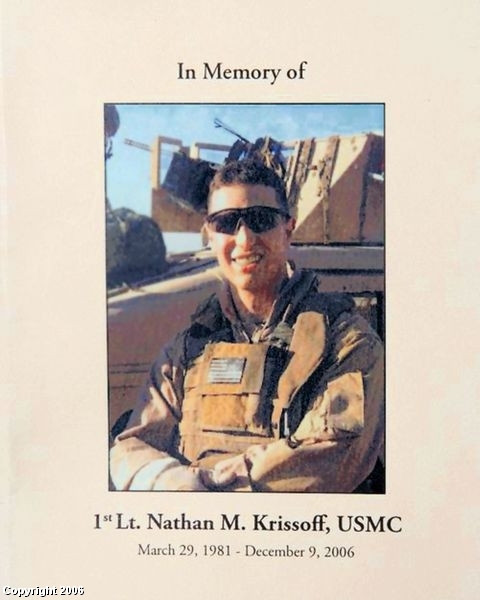 1STLT Nate Krissoff ’03, USMC died two years ago today. As long as there is an EphBlog, we will remember his service and sacrifice. Read this and this. Note: I wrote this post a couple of weeks ago, so any issues of tense or time are the fault of that. I don’t have the emotional energy to spend the time updating such things right now; I hope you will forgive me that. David nudged me today about actually publishing it, and I guess I might as well. The (relative) anonymity of this blog allows me to be a bit more raw emotionally than I normally would. Upon re-reading the post, I realized that it was exactly what I was trying to capture. I was all set to write a somewhat self-righteous post this evening about the Williams Social Action Fund, the importance of donor choice, and the inherently political nature of ALL investment decisions (meaning choosing profit over the purpose of a company IS a political choice regardless of the terminology in which you wrap it). But I won’t be writing that post tonight. I won’t be writing it because of the few minutes I spent this afternoon looking up what, how, where, and to whom packages can be sent to support soldiers serving in harm’s way. Taking those moments put me in mind of those that have been lost. We have this weird e-relationship, all of us here on Ephblog, so a lot of what we think about and feel is filtered, kept at a distance from one another. It is hard for us to really get to know each other, to share our feelings, to understand where each other one is really coming from. So this post is to attempt to not filter that, to let you all know how profoundly my thoughts were impacted by this little blog today. I spent much of this afternoon and evening thinking about a fellow Eph, a young man whose life was lost far too soon. A young man whose goofy humor, friendship, loyalty, and sheer joy I don’t think I ever fully appreciated as he hung out in my common room or caused trouble in my entry: Nate Krissoff ’03. I have thought about him periodically, on Veteran’s Day and this weekend for the Fourth of July. I wonder how his parents are doing. More often, I wonder how his friends are, those that I knew well and I know loved him dearly. I remember the late, late nights when I finally encouraged him and other frosh boys (mostly swimmers) to move on out of my common room so I could get some sleep. A couple of his friends were in my entry when I was a JA, and there were three or four of them that hung around and did what 18-19 year-old boys do: drink, talk, laugh, quote stupid movies (I remember them quoting Swingers a lot), watch sports, etc. When we lose someone so young, I wonder what else I should have or could have done to make sure that he knew what a special person he was. I didn’t keep in touch with Nate after I graduated. I heard bits and pieces about him and others over the years, but we weren’t close when he died. But I still sat here this evening and could not contain my tears and my grief at this life cut tragically short, of this waste of a precious person. And I think that I should do everything in my power to try to prevent anyone else from dying, and I think that I should do everything in my power to ensure that everyone serving knows that they are loved and special and supported and comforted. We have had many discussions on EB about whether one can simultaneously support our troops and fervently wish them home and that their service was not necessary. We have wondered from an intellectual perspective, argued the opposing logic or philosophical conflict. We have distanced ourselves at times from the true danger that some people are in – perhaps we must distance ourselves. I am not writing tonight to wade once again into that thicket of recriminations and judgment. My contemplative mood this evening also put me in mind of one of my own frosh who tragically died very young, although under very different circumstances. Shirin Shakir ’03 passed away in a rafting accident in Peru during her 2L year at Harvard. She was a dear, sweet person. Memorable for her striking beauty, her little giggle that brightened the room, for her desire to make a difference somehow. She, like many Ephs, held herself to very high standards, was very thoughtful, and had big dreams. I wonder who she would have become. She was well on her way, having spent a great deal of time volunteering in her community and on legal cases. So forgive my posting this evening in sadness, but at times I really do need to remember to step back and think about what is important. To remember how precious these moments are that we share together. I need to appreciate those fellow Ephs that I got to know, for however short a time. Tonight I simply wanted to express that I truly, profoundly mourn those like Nate Krissoff and Shirin Shakir. 1st Lt Nate Krissoff ’03, USMC died a year ago yesterday. Since that time, we have maintained a link at the upper right to our collection of related posts, as sad and inspiring as anything you will ever read at EphBlog. Yet, tomorrow, that link comes down. Time leaves behind the bravest of our Williams warriors and Nate’s sacrifice now passes from News to History, joining the roll call of honored heroes back to Colonel Ephraim Williams, who died in battle during the Bloody Morning Scout on September 8, 1755. 1st Lt Nate Krissoff ’03, USMC died a year ago today. National Public Radio covers the story of his father’s enlistment in the Navy Medical Corps. Listen to the audio. It includes a revealing reference to Karl Rove and closes with words to make every father cry. Entire article is below the break. UPDATE: Former Marine Tony Fuller ’89 sends this link. Read the whole thing. Dr. Bill Krissoff, father of 1st Lt Nate Krissoff ’03, USMC, has joined the Navy. Former East Grand Rapids resident Bill Krissoff never figured to be in a position to look President Bush in the eye and ask a favor. But there he was, sitting in a room in Reno with Bush and several other families who had lost soldiers in Iraq or Afghanistan. 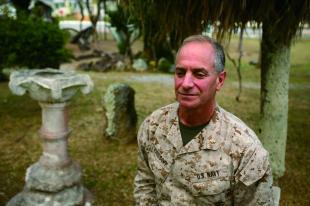 His son, Marine Lt. Nathan Krissoff, had been killed in a December 2006 roadside bomb explosion in Iraq. Bush went around the room and asked if there was anything he could do. “I said, ‘Yah, there is one thing. I want to join the Navy medical corps and I gotta get some help here,'” recalled Krissoff, 61, a 1964 graduate of East Grand Rapids High School who now resides in California near Reno. Three days after that August meeting, the Navy called. His waiver had been granted. Krissoff was commissioned a lieutenant commander Nov. 18, after which he expects to attend officer development school in January. Attached to the 4th Medical Battalion, he is on course to join a combat surgical team. He hopes to serve in Iraq. Krissoff and his wife also appeared on a CBS Morning segment. CBS News picked up the story from People magazine. A scan of the article is below. The Krissoff’s other son is also a Marine officer. His wife, Christine, 56, has made peace with his choice as well. But it doesn’t mean she won’t miss her husband. “I am not fine with the amount of time he’s gone. But none of the wives of the military people who serve are going to be fine with it. His mother, East Grand Rapids resident Sylvia Krissoff, 88, said she was “shocked” when she learned what he planned to do. Then it started to make sense. “I think, for him, it really is great. It’s really an extension of his love for Nate and, in some ways, carrying on for what Nate would have done. 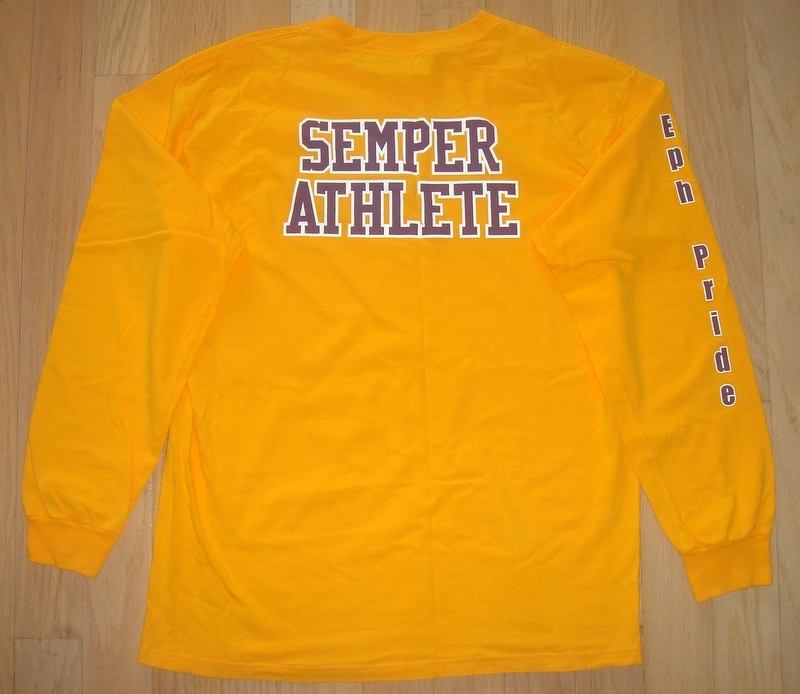 The Ephmen of Williams Swimming and Diving dedicated their 2007 championship season to Nate when they proudly wore their conference shirts emblazoned with the simple words on the back: “Semper Athlete.” (“Semper,” obviously for the Marines, and “Athlete,” one of his favorite terms for any of his teammates.) Nate would be proud of “his boys”: each of the 24 Williams conference team members had a hand in dominating the NESCAC competition. By the time it was over, the Ephmen had scored 2,019.5 points — surpassing the tally of their nearest competitor, Amherst, by more than 50% (711.5 points). First Lieutenant Nate Krissoff USMC ’03 died in action exactly 6 months ago today. How many Ephs remember him? How many will remember him a year or ten from now? How many remember the sacrifices of Ephs like Myles Crosby Fox ’40? Not enough. But Ben Doob ’02 will remember. He delivered this beautiful eulogy at Nate’s service. I was crying by the end. A temporary bronze plaque honoring Nathan Krissoff ’03 should be placed in Thompson Memorial Chapel in time for the June 10th Annual Alumni Memorial Service. Only Ephs who have fallen in battle get their names inside the Chapel sanctuary. Facing the back of the Chapel, up on the left back wall is a large stone scroll with the names from the Korean and Vietnam Wars. The right back wall is currently empty. Nathan’s bronze plaque will be placed on the right back wall. If other names need to be added, each will get his own plaque to be placed on the wall with Nathan’s. When all of the names are known, the plaques will be removed. A stone scroll to match the other wall will be put up, and the names permanently placed in the stone scroll. The temporary plaques will be given to the families. There was a memorial paddle for Nate Krissoff last month. On Dec. 24th there will be a memorial Paddle held on the Truckee River with a paddle on a class 2-3 section from East Verdi to Mayberry Park in west Reno. If you would care to join us in commerating Nathan’s life and love of the outdoors you are encouraged to meet at Mayberry Park at 9am and we will be putting in at below the Mogul Diversion Dam on the Old Lincoln Highway in East Verdi at 10am. Flow on the Truckee River at this time is about 400 cfs and the water is COLD. Please dress appropriately, there will be food and drinks afterwards. PLEASE help us get the word out to any folks that you might think would care to join us. Did any readers participate? Tell us about it. A tribute to Nate Krissoff from Seth Borland ’03, his swim team co-captain. I still remember when Nate Krissoff ’03 first called me “baby.” A few minutes earlier while scavenging the cheese selection at the “meet the president” party during First Days, another freshman swimmer introduced me to Nate. We had your typical get-to-know-you conversation, discussing our backgrounds, where we were from, and where we lived on campus. He was from Reno, I was from Pittsburgh. He went to a prestigious west coast boarding school, I went to a small east coast private school. He lived in Fayerweather, I lived in Williams Hall. Though we had little in common we clicked, and for some reason I didn’t falter when he called me “baby.” It seemed natural, and without thinking too much about it, I also began using the word. It been a while since I first emailed you, but I’ve been meaning to write for a while. I’d like to express my gratitude for your offering Ephblog as a place to remember Nate Krissoff, and to share stories and pictures. I hope you have heard this from many other people, but I’d like to say thank you as well. At his services, a number of people I spoke with mentioned the site, the things written there, and how much they appreciated it. Somehow the more I see and read the more it helps, and I think a lot of Nate’s friends feel the same way. Any way to keep his memory alive and to honor him helps ease the pain. Thanks for all you have done. I never had the honor of knowing Nate, but I knew many Marines like him, Marines who would unthinkingly lay down their lives so that my daughters might live safely through the darkness of this long war. By helping keep Nate’s memory alive, I thank both him and all our other warriors for their sacrifices and service. And so I ask again for more memories of Nate. With each passing day, those memories grow ever dimmer. Share them with us. Did you have a class with Nate, live in the same dorm, swim with him for Williams, spend time with him in the snack bar? If so, tell us about it. However brief and unimportant the interaction might seem to you, Nate’s close friends and family will appreciate, in the decades to come, recalling every time that Nate touched another’s life, both at Williams and elsewhere. Thanks to Todd Gamblin ’02 for suggesting that we add a link to all posts which refer to 1st Lt Nate Krissoff, USMC ’03. We have added the link, which retrieves every relevant post. The link will stay until the Williams Memorial for Krissoff. I believe that this is scheduled for January, but I don’t have further details. Those interested in the outlook of Marines like Krissoff during the holiday season may enjoy “A Soldier’s Christmas,” reprinted below. More coverage of the funeral of 1st Lt Nate Krissoff ’03, USMC. When terrorists struck the United States on Sept. 11, 2001, former Reno resident Nathan Krissoff put his life on hold to protect his nation. A Truckee native, Krissoff died Dec. 9 from wounds sustained in a roadside bombing in Iraq’s Anbar province. The first lieutenant was 25 and a Williams College graduate who put his international affairs career on hold to join the military. The standing-room only crowd filled Nightingale Concert Hall on the University of Nevada, Reno campus, where Krissoff was posthumously awarded a Purple Heart. The 90-minute service included “God Bless America,” the “Battle Hymn of the Republic” and the Jewish mourners’ kaddish — a solemn prayer. Law enforcement motorcycles escorted the hearse carrying the flag-draped coffin to Mountain View Cemetery. During the memorial at UNR, Krissoff was remembered as a charismatic leader and a “modern-day knight” dedicated to protecting the Constitution. The names of presidents Abraham Lincoln, Theodore Roosevelt and Dwight Eisenhower were mentioned in remembering Krissoff. Commissioned as a second lieutenant in August 2004, Krissoff was with the 3rd Marine Division, where he served as a counterintelligence officer. And Gov.-elect Jim Gibbons noted to mourners Saturday that Krissoff was sent to Iraq on the fifth anniversary of the 9/11 attacks. Acting on intelligence not long before his death, Krissoff helped save the life of an older Iraqi man from insurgents, Gibbons said. Stories like this from Iraq “rarely” make it into the mainstream media, said Gibbons, a combat pilot in the Vietnam and Persian Gulf wars. This resulted from fact-gathering “up close and personal and often in the most dangerous places,” said Dubrule, the Marine captain who read comments from soldiers serving with Krissoff. Krissoff was the son of Dr. and Mrs. William Krissoff and attended Roy Gomm Elementary School and Darrell Swope Middle School in Reno. He later attended Stevenson prep school in Pebble Beach, Calif., where he was a standout athlete. He graduated from Williams in Massachusetts, where he earned a political science degree and was captain of the men’s swim team. He landed a job with an international studies institute in Washington before joining the Marines. We are also planning to make him a shadowbox with a folded flag, all of his medals, his Williams swimming and polo caps, a plaque, and other mementos. The news report is accurate, and the concert hall was standing room only. The procession to Mountain View mortuary was also incredibly packed. As Nate’s father said to me, the overwhelming response is entirely due to Nate, and I think the number of people who came to his service does him more justice than anything I could say here. A remarkable number of swimmers (including myself) made it out on short notice. To give you an idea, one swimmer came all the way from China to see Nate. Two others, after missing the last flight out of New York on the 22nd, took a late flight to Sacramento and drove the rest of the way overnight. AP coverage of the funeral for Nate Krissoff. A former Reno man who suspended his career to enter the Marines after the Sept. 11, 2001 terrorist attacks was praised at his memorial service as a “modern-day knight” who made a difference. Nathan Krissoff, a native of Truckee, Calif., where his father is an orthopedic surgeon, died Dec. 9 from wounds received in a roadside bombing in Iraq’s Anbar province. The first lieutenant was a Williams College graduate who put his international affairs career on hold to join the military. The standing-room only crowd filled Nightingale Concert Hall on the University of Nevada, Reno campus Saturday, where Krissoff was posthumously awarded a Purple Heart. Law enforcement motorcycles escorted the hearse carrying the flag-draped coffin to Mountain View Cemetery. I have been unable to locate any pictures from the event. Are any available? We would be happy to post them here. During the 90-minute memorial, Krissoff was remembered as a charismatic leader and a “modern-day knight” dedicated to protecting the Constitution. After college and while working in Washington, D.C., Krissoff interviewed with the CIA but was told by the agency he was too young. Old editions of the Record are not on-line so I can’t easily document that, back in the day, campus radicals actively protested when the CIA came to campus to recruit. The lowlight of these activities came when these students performed a “citizen’s arrest” of the recruiter. That all seems a long time ago. Commissioned as a second lieutenant in August 2004, Krissoff was with the 3rd Marine Division, where he served as a counterintelligence officer. Gov.-elect Jim Gibbons noted to mourners Saturday that Krissoff was sent to Iraq on the fifth anniversary of the 9/11 attacks. Acting on intelligence not long before his death, Krissoff helped save the life of an older Iraqi man from insurgents, Gibbons said. Stories like this from Iraq rarely make it into the mainstream media, said Gibbons, a combat pilot in Vietnam and both Persian Gulf wars. Are those comments available anywhere? Many Ephs who could not make the service would like to read them. Krissoff was the son of Dr. and Mrs. William Krissoff and attended elementary and middle school in Reno and Stevenson prep school in Pebble Beach, Calif. He graduated from Williams in Massachusetts, where he earned a political science degree and was captain of the men’s swim team. He took a job with an international studies institute in Washington before joining the Marines. “I think the thing that is most telling about his character is the fact that this is a young man with a whole lot of options available to him, and he wasn’t looking to learn a trade or a skill,” Dubrule said after the memorial. Indeed. If any EphBlog readers were at the funeral, we would appreciate knowing your thoughts on the service. A picture of Nate Krissoff and the man he helped rescue. 1st Lt Ballard provides the background. As we’re still prosecuting targets related to this particular raid, there are a lot of specifics I can’t get into. Several groups have the habit of kidnapping individuals with the intent of influencing tribal/religious/political groups. Others do it for revenge. Our hostage was abducted for the second reason. Like thousands of other Iraqis, He had accepted compensation from Coalition Forces for damages to his home that were incurred during the second battle of Fallujah. Unfortunately for him, the bad guys found out about it. We had reliable intelligence leading us to specific residences. In one of these residences we found four males. As our orders were to detain all military aged males (MAMs) on sight. As Nate began the on scene interrogation, one of those MAMs showed significant signs of torture and deprivation. Long story short, the other three MAMs had kidnapped the first MAM several days earlier. His decapitation was scheduled to be videotaped later that same morning. Nate’s skills were crucial during the process. The intelligence/evidence that Nate obtained were critical to insuring the effective legal prosecution of the other 3 detainees. It also lead us to finding several weapons caches utilized by this same “bad-guy” group. If the war in Iraq is ever to be won, it will be done so via one helped Iraqi at a time. EphBlog is powered by WordPress and delivered to you in 1.441 seconds using 39 queries..